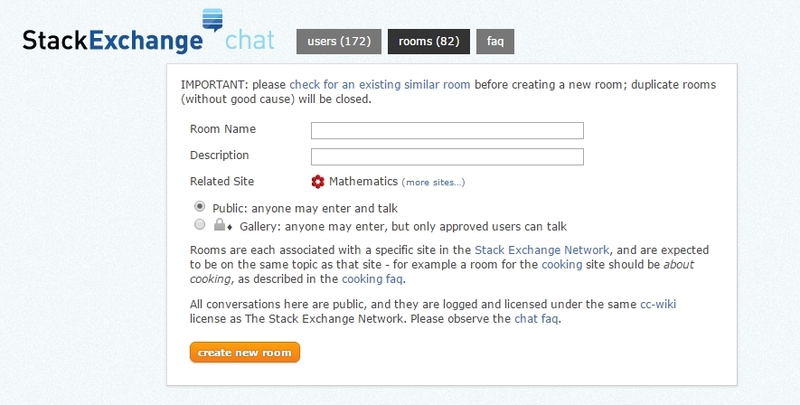 How to create a chat room in MSE? I have seen some of the users have created their chat rooms. I, too, wanted to create my own chat room. So, how can I create, please somebody help me? Click on "Create a new room" (Note that this option will only pop up for users with over 100 reputation). Then, a window like this should pop up: Be sure that the "Related Site" is "Mathematics" and choose a Room Name. You may configure the options to your preference, and then click on "create new room". Note that all conversations are public, regardless of the options you choose. How can I unfreeze a room in chat room for a new similar use?